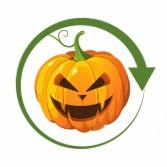 Have a Clean & Green Halloween! Halloween is a spectacular event, but can become very pricey and environmentally damaging! GPOD is a proud supporter of the environment and we have some tips on how to stay clean and green this Halloween Season! Reusable Trick-Or-Treat Bags – Don’t send your kids out trick-or-treating with a plastic, non recyclable bag! Look for eco-friendly, reusable bags that will last for years to come and won’t destroy the environment. Plastic bags use millions of gallons of fossil fuels to produce and end up as litter, which kills millions of animals each year. Paper bag production uses 14 million trees a year! Opt for festive bags like a Halloween ChicoBag. Not only are they eco-friendly, but they will hold better and longer than a plastic or paper bag! Buy them online here or at a store near you! Do-It-Yourself Costumes – Why spend good money on a costume your kids will only wear once? Instead, make a costume together! Take an afternoon to spend time with your kids and make a costume they will love and appreciate. Head to your local thrift shop or use clothes you already own to whip up something magical! Or you can set up a costume swap with your friends and their kids! Free and fun! Give Organic – Rather than filling the neighborhood kids with unhealthy, non-environmentally friendly candy, shop for organic candy that tastes just as sweet without the stomachache! Also, buy locally when you can to boost your local economy and help out a neighbor. Not big on any kind of candy? Hand out colored pencils or crayons to keep the kids busy all year long! Throw a Green Halloween Party – Instead of splurging on harmful decorations look around your house. Use old sheets for ghostly appearances and think local for pumpkin carving and bobbing for apples. Serve organic foods for healthy fun and use dishes, utensils and napkins that can be washed and used again. Save any strictly Halloween décor for next year and get more bang for your buck! Also teach your kids to throw away and recycle any candy wrappers they have acquired while at their own Halloween festivities! But don’t stop there! Keep going green all year long! Become a regular at the local farmers market and learn to compost old foods. Think of reusing old clothing and upcycling for new designs, or setting up a clothing swap with your friends! And don’t forget to use GPOD for any dumpster or storage pod services. We recycle 80% of the waste we collect and keep an environmentally friendly storage service customized for convenience. Think “Recycle” for Back to School Supplies! It’s that time of the year again! 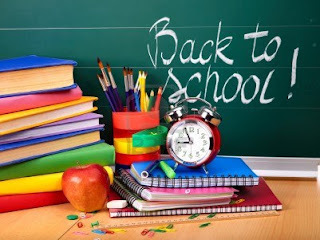 Fall is on the horizon and back to school shopping is on the brain! We know this is a stressful time and those back to school supplies can add up to a pretty penny, so we have some tips to keep you on your A game! - LOOK BACK. First, go through last year’s supplies to see what needs to be thrown out and what can be reused. Is every pen out of ink? Are all your pencil’s now stubs? Did your children use all the notebook paper? - RECYCLE. All those old supplies that you can’t use could be used somewhere else! Find out where you can recycle paper, pens, and other supplies near you! - MAKE A LIST. Before hitting the store make a list of things you need and try to stick to only the list when at the stores. Those bright colors and new gadgets are hard to resist but keep your eye on the prize! - BUY RECYCLED. Join the green trend and buy recycled items. Recycled items range from backpacks to paper so ask your local store where you can find green back to school supplies. We know Target and Office Max are a great place to start! - WEAR GREEN. Back to school clothes are a must have in a child’s wardrobe. Instead of hitting the stores, set up a swap with friends or family. Kids grow out of clothes quickly so those barely worn jeans might fit your children perfectly! - BREATHE FRESH AIR. Look for nontoxic items such as ink and art supplies, water based paints and batteries with little mercury. Also look for the closest bus stop instead of driving your children to school. Think about carpooling with neighbors too. Follow these tips and you’ll be sure to kick off the school year right! If you need help throwing away last years large science projects, or debris from summer home improvement projects, trust GPOD with your dumpster needs! Have a great school year everybody!